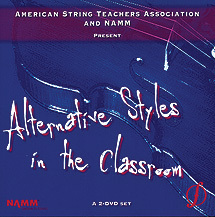 The American String Teachers Association (ASTA), supported through a grant from NAMM, has designed this DVD to bring alternative styles into your classroom. Whether you are a teacher trying to encourage more students to participate in your program, a student interested in learning new music styles, or an educator who just wants to expand his or her curriculum, this DVD is for you. Join 22 of the world's top alternative styles artists as they discuss why alternative styles are important, how to bring new techniques to the classroom, and how to seamlessly incorporate alternative styles into the traditional curriculum.